Amalia of Solms-Braunfels (31 August 1602, Braunfels – 8 September 1675, The Hague), was Princess consort of Orange by marriage to Frederick Henry, Prince of Orange. She acted as the political adviser of her spouse during his reign, and acted as his de facto deputy and regent during his infirmity from 1640–47. She also served as chair of the regency council during the minority of her grandson William III, Prince of Orange from 1650 until 1672. She was the daughter of count John Albert I of Solms-Braunfels and countess Agnes of Sayn-Wittgenstein. Braunfels is a town in the Lahn-Dill-Kreis in Hesse, Germany. It is located on the German Timber-Frame Road. Amalia of Solms-Braunfels, born into the House of Solms, a ruling family with Imperial immediacy, spent her childhood at the parental castle at Braunfels. Solms-Braunfels was a County with Imperial immediacy in what is today the federal Land of Hesse in Germany. Imperial immediacy was a privileged constitutional and political status rooted in German feudal law under which the Imperial estates of the Holy Roman Empire such as Imperial cities, prince-bishoprics and secular principalities, and individuals such as the Imperial knights, were declared free from the authority of any local lord and placed under the direct authority of the Emperor, and later of the institutions of the Empire such as the Diet, the Imperial Chamber of Justice and the Aulic Council. She became part of the court of Elizabeth, wife of Frederick V, Elector Palatine, the "Winter King" of Bohemia. After imperial forces defeated Frederick V, she fled from Prague with the pregnant queen to the west. Shelter was denied to them along the way because the emperor forbade it as Frederick had been placed under an Imperial ban. Elizabeth went into labour during their flight and Amalia helped her with her delivery of Prince Maurice at Küstrin castle. The end of their journey was The Hague, where stadtholder Maurice of Nassau, uncle of the elector gave them asylum in 1621. They often appeared at his court, where Maurice's younger half-brother Frederick Henry became infatuated with Amalia in 1622. She refused to become his lover and held out for marriage. When Maurice of Nassau died, he made his half-brother Frederick Henry promise to wed. Frederick married Amalia on 4 April 1625. When Frederick Henry became stadtholder after the death of his half-brother Prince Maurice, his influence grew substantially, as did Amalia's. Together Frederick Henry and Amalia succeeded in expanding court life in The Hague. They had several palaces built, including Huis ten Bosch. Amalia was a great collector of art and amassed many jewels, which were inherited by her four surviving daughters. She was described as intelligent, arrogant and ambitious, not beautiful but with a fresh and appealing appearance. Amalia was the prime mover of several royal marriages, including that of her son William II to Mary, Princess Royal of England and Scotland (daughter of King Charles I of England) and of their daughters with several German princes. The relationship between Amalia and Frederik Hendrik was described as happy, and Amalia is acknowledged to have acted as his political adviser. From 1640 until his death in 1647, Frederik Hendrik's health (he suffered from gout and probably also from a form of Alzheimer's) made it increasingly difficult for him to participate in politics, and during these seven years, Amalia therefore effectively functioned as regent and stadtholder, maintaining diplomatic contacts and making political decisions on his behalf. Her de facto political position was acknowledged and diplomats, aware of this, tried to influence her decisions by costly presents. It was reportedly Amalia who was behind Frederik Hendrik's participation in the negotiations which was eventually to result in the Peace of Münster of 1648. As a recognition, King Philip IV of Spain granted her the seigniory and castle of Turnhout in 1649. In 1647, her spouse died and was succeeded as stadtholder and prince of orange by their son William II, Prince of Orange. In 1672, her grandson was declared adult and his regency council thereby dismissed. Amalia retired and witnessed him becoming stadholder of Holland, Zeeland, Utrecht, Gelderland and Overijssel and captain-general of the Union. A wine from wine estate Solms-Delta in Franschhoek (South Africa) is named after Amalia of Solms-Braunfels. The wine honours the role played by her in Dutch political life. Her grandson, William III, King of England, provided refuge and support to thousands of French Huguenots after the revocation of the Edict of Nantes in 1685. Some 180 of these refugees, fleeing religious persecution, were relocated to the Cape and granted farms in Franschhoek. Here they laid the foundations of the modern South African wine industry. Countess Elisabeth of Nassau-Dillenburg was a daughter of William I, Count of Nassau-Dillenburg and Juliana of Stolberg and was one of the sisters of William the Silent. 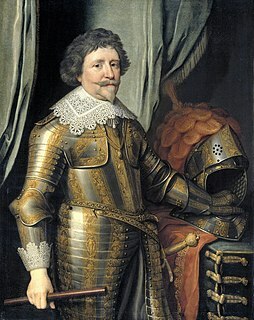 Frederick, Burgrave of Dohna was a German nobleman, an officer in Dutch service and a governor of the Principality of Orange. He later also rendered services to the Electorate of Brandenburg. Near the end of his life, he chose Switzerland, where he was highly regarded, as his adopted country. 1 2 3 djr (18 January 2018). "Digitaal Vrouwenlexicon van Nederland". resources.huygens.knaw.nl. 1 2 3 4 5 djr (18 January 2018). "Digitaal Vrouwenlexicon van Nederland". resources.huygens.knaw.nl. Retrieved September 16, 2014.